The Alston Observatory is the purpose-built teaching and public outreach facility of the Jeremiah Horrocks Institute. 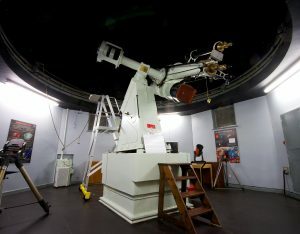 It comprises a group of both modern and historical telescopes, a new Discovery Dome planetarium system and an exhibit on Telescopes as Time Machines funded by the Royal Astronomical Society. 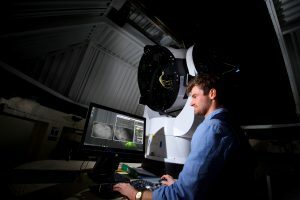 Our centerpiece is the brand new Moses Holden Telescope, a 70 cm diameter state-of-the-art robotic telescope used for both undergraduate teaching and to encourage public engagement in science. Alongside the MHT we also have a range of smaller robotic telescopes ranging in size from 20 to 30 cm in diameter. Additionally we host the historic Wilfred Hall Telescope on behalf of the Royal Astronomical Society. Our Discovery Dome is an exciting system that allows a laptop computer and digital projector to display movies onto a planetarium dome, located in our main building, as well as enhanced planetarium shows. 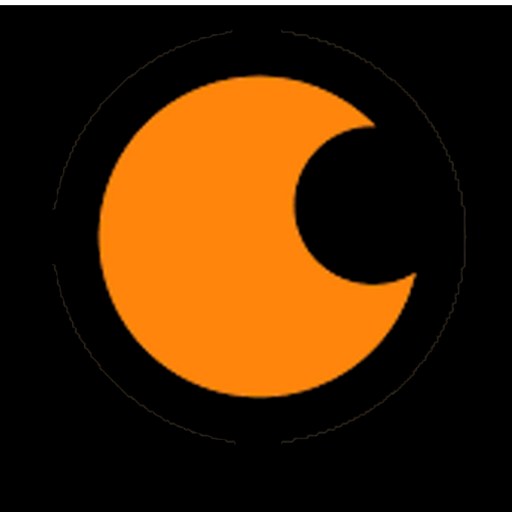 This enables both informative material to be presented for evening events, and educational material for curriculum enhancement. Information on the wide range of activities offered by the Alston observatory team can be found on these pages. If you would like to contact us for further information or to make a booking, please e-mail us at alstonobservatory@uclan.ac.uk Please note all visits must be pre-booked as Alston Observatory is not an open site. For Scouting and Guiding groups, we have considered the rules on adult ratios. To help with your planning a total 30 young people (Rainbows, Beavers, Cubs, Brownies, Guides, Scouts and Young Leaders), with the appropriate number of adult Leaders in line with Scout or Guide rules for the section, can be accommodated within the Planetarium room. We may ask excess Leaders over the requirement to remain outside the planetarium room (but in the building!) to enable all the young people to participate. Click here for infomation about up and coming events at our observatory. In summer 2015 we received delivery of our new state-of-the-art 0.7m Planewave CDK700 Telescope. This telescope was named the Moses Holden Telescope in honour the local Astronomer Moses Holden, who was one of the founding fathers of the Institute for the Diffusion of Knowledge, a precursor institute for the University of Central Lancashire. 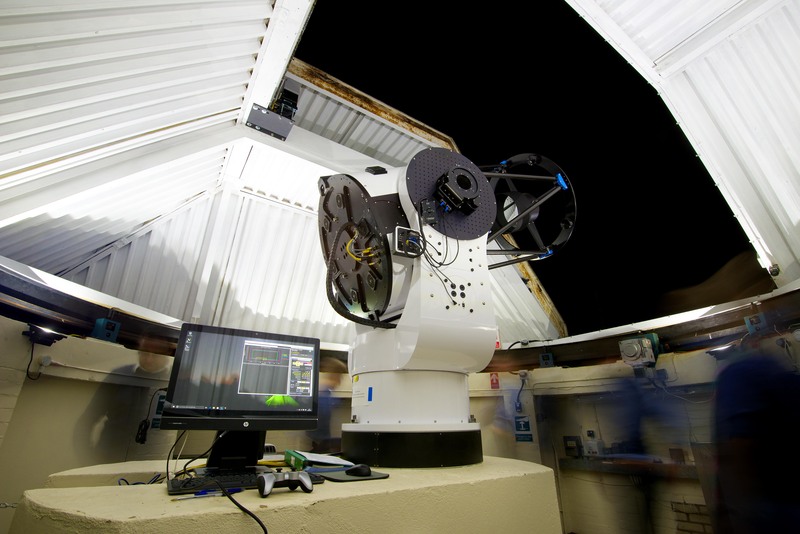 This telescope is the most modern telescope available in the UK and is used for both undergraduate teaching and public outreach activities. Although only installed for a short time the telescope has already distinguished itself by imaging planets, nebulae in the Milky Way, distant galaxies and even confirming the presence of a planet orbiting a nearby star. A new camera for the Moses Holden Telescope at Alston Observatory saw first light on the evening of September 7th 2016 and took this stunning image of the Ring Nebula. Images of the telescope and images taken from the telescope can be found On the gallery page. 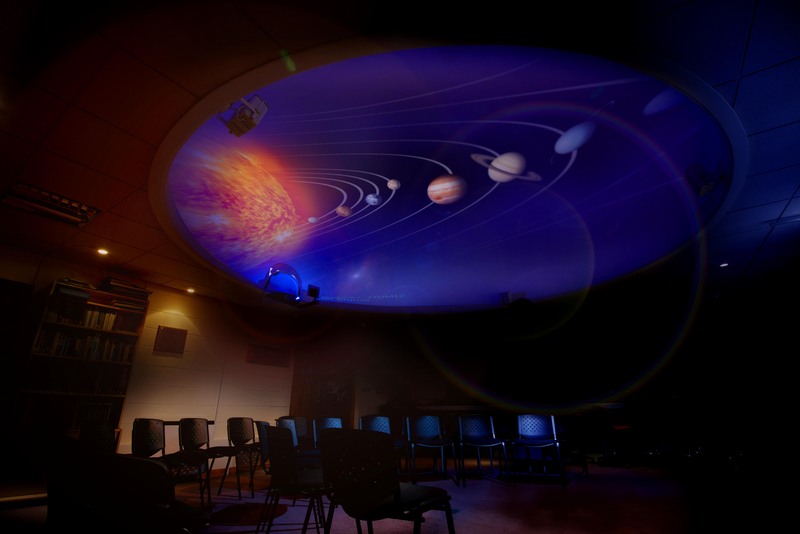 At Alston Observatory we are privileged to have a fixed planetarium dome and HD projector which can seat up to 25 adults or 30 children (under 14’s only). This is a unique way for both school children and the general public to discover the universe from the comfort and warmth of the Alston planetarium. It also makes a great alternative to observing when the British weather is not at its best. We also run the Stellarium software to tell the stories behind the constellations, tour the Solar System, and explain how to navigate the night sky. In Summer 2013 Dr Joanne Pledger was awarded an IoP public engagement grant to turn the previously disused Wilfred Hall Telescope Dome into a Exhibition Space. In the coming months various exhibits will be added to the dome. These will incorporate all the different research areas currently active at the Jeremiah Horrocks Institute and will show how each, seemingly different, research topic is linked to the others. Measuring the Cosmos, this applies the fundamental parallax technique to the measurement of distances to an artificial “constellation”, demonstrating how difficult it is to determine distance in the Universe. Telescopes as Time Machines looks at the 400 year history of the telescope, and relates observations to our understanding of the Universe, providing discussion points for understanding the idea that distance equates to time into the past when we are considering the vast distances beyond out solar system.